Home » Tech Tips » Windows 10 » How to Add Missing This PC Icon on Windows 10? Once the “My Computer” icon was popular on Windows PC’s desktop. You can double click or right click and choose “Open” to view all the connected drives on your computer. This will help you to explore the files on your PC and check on the external hard drives and USB. Microsoft renamed “My Computer” icon and change it to “This PC” in Windows 10. By default, Windows 10 will NOT show This PC icon on the desktop. You can use File Explorer by simply pressing “Win + E” keys to access the files. However, you cannot get the quick detail that This PC icon offers like viewing the computer properties. If you are missing This PC icon here are the ways you can bring it back on the desktop. Right click anywhere on the desktop and hover the cursor over “View” option. Next, select “Show desktop icons” by clicking on it. You should see a tick mark in the front after selecting the option (you need again right click and check). This will show all the hidden icons on your desktop. Check now you can see This PC icon. If This PC icon still does not appear on the desktop, then you need to add it manually. Press the “Start” menu on the lower left corner of the screen and click on the “Settings” icon. This will open Windows Settings app. Alternatively, you can press “Win + I” keys to open Windows Settings app. 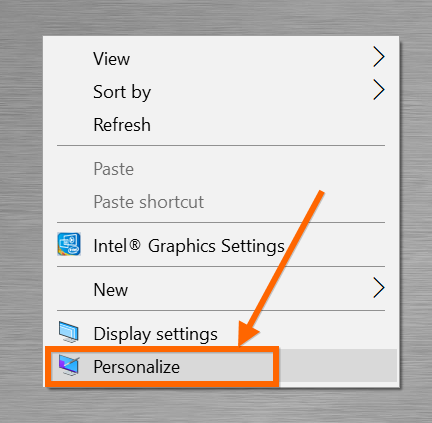 Select “Personalization” option to view options to customize desktop background, colors and theme. Click on “Themes” from the sidebar and scroll down to “Related Settings” section. When you have wide monitor screen, the “Related Settings” will show in the right sidebar. Select “Desktop icon setting” to open the “Desk Icon Settings” dialog box. You can see various checkboxes for items under “Desktop icons” section. Windows will show the checked items on the desktop and hide all unchecked items. Check the “Computer” item and click on “Apply” and then “OK” buttons. Now, press “Win + D” keys to show desktop and you can see This PC icon will be there. You can also personalize the desktop by right clicking on the desktop and going to “Personalize” option as shown below. 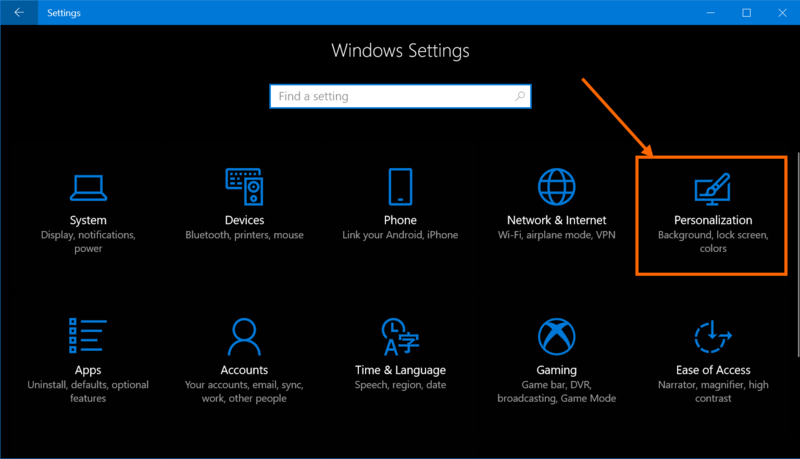 It will open the Windows Settings app, from there you can go to “Themes” section and enable This PC icon as explained above. You can also search “desktop icon settings” from Windows search box and choose “Themes and related settings” option. The above settings will work when you use one of the default Windows theme. If you have custom Windows theme, it could disable the This PC icon. In this scenario, disable “Allow themes to change desktop icons” option on the “Desktop icon setting” dialog. This will help to retain your desktop icons even you change to any custom themes from Windows Store. If you do not like the default This PC icon display, select the icon and click on “Change icon…” button when you are in “Desktop icon settings” dialog. Choose your favorite icon from the list and set that as your This PC icon on desktop. After adding This Icon on your desktop, right click on it. 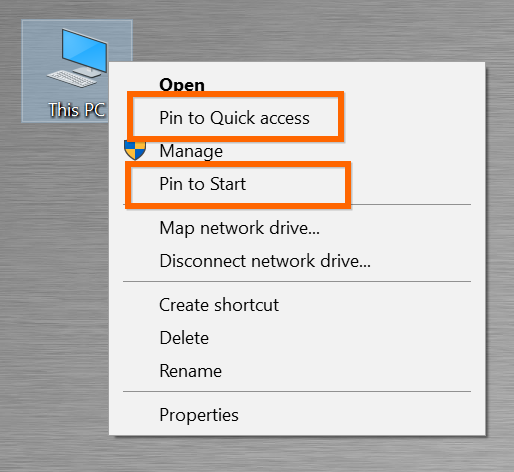 Choose “Pin to Quick access” option to add the shortcut to Quick Access section in File Explorer. Likewise, you can also pin it to “Start” menu by selecting “Pin to Start” option. However, we do not see an option to add This PC icon to your taskbar. This PC icon is definitely useful in multiple ways. For example, you can right click on it and go to “Properties” to view the following details of your computer. Generally, you can get this detail by going to lengthy “Control Panel\System and Security\System” path. System technical details like processor, RAM and OS type. Windows 10 is a powerful operating system; however, it has so many options to hide or show the stuff you like. If you are fond of “My Computer” or “This PC” icon, you can bring it back as explained above.